A plaque commemorates the erection of Campbell`s Department Store at this location. It was one of the department store chain established in 1862 by Malcolm Campbell in Muswellbrook. Other stores were opened in Denman, Aberdeen, Rouchel, Merriwa, Murrurundi and Moonan Flat. A pleasant and interesting ceremony, and which, though of a semi-private character, is destined to become historic, took place yesterday afternoon at the magnificent edifice in course of and now to the order of Messrs. M. Campbell and Co., Ltd., to do duty in the years to come as the company's warehouse for the Scone branch of their extensive business. It was the unveiling, by Mrs. Malcolm Campbell, of St. Heliers, widow of the founder, as far back as the middle '50 's of last century, of the great firm bearing his name, and whose business ramifications now spread to the remotest parts of the Upper Hunter, and even beyond them. Mrs. Campbell, despite her 88 years, looked wonderfully well, manifested the keenest interest in the proceedings, and joined the other members of the party in an inspection of the building. Mr. Humphries (managing director) asked Mrs. Campbell to unveil the tablet, a request to which the good old lady acceded. 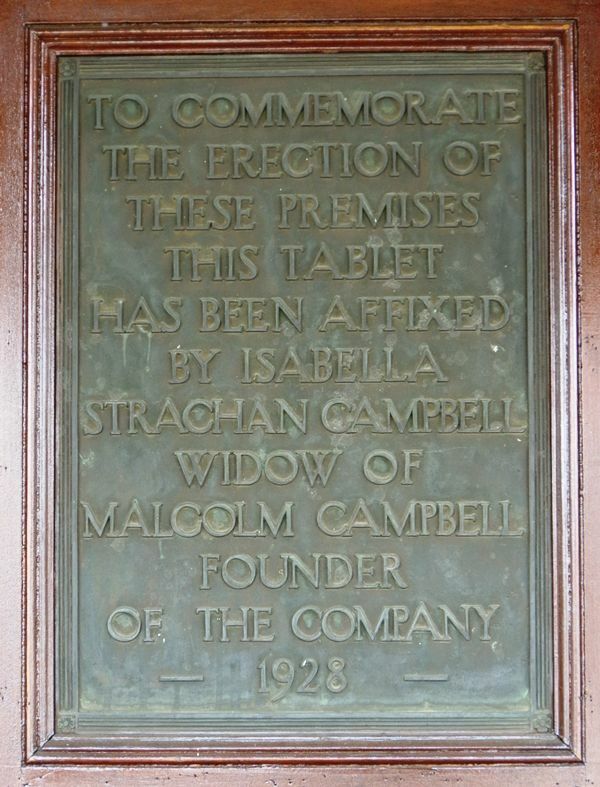 The tablet bears the following words: —"To commemorate the erection of these premises this tablet has been affixed by Isabella Strachan Campbell, widow of Malcolm Campbell, founder of the company, 1928." Subsequently, following an inspection of the building, the party partook of afternoon tea, at the conclusion of which Mr. Sherwood, in thanking the visitors for their attendance, said they hoped, by following the fine example, business principles, and rectitude of the late Mr. Campbell, the great business which he had founded would continue to prosper. Scone Advocate (NSW), 26 October 1928.